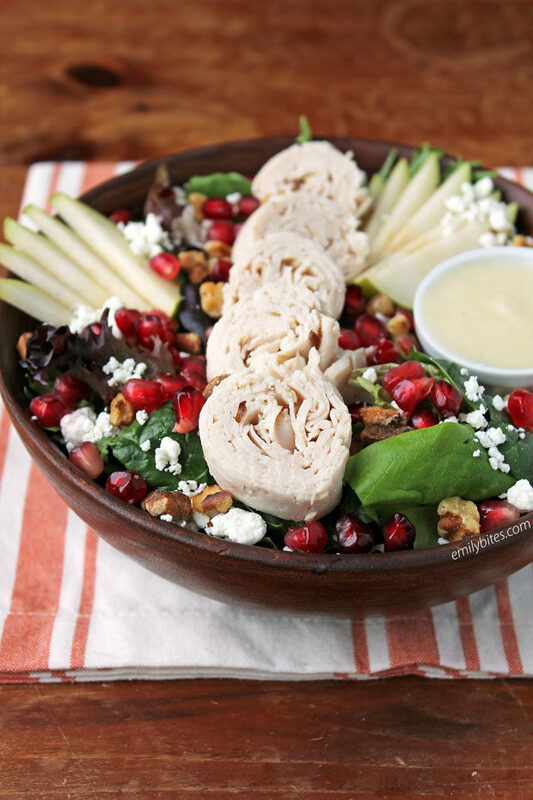 I love a big seasonal salad, and this Turkey and Pear Autumn Salad is perfect for fall! 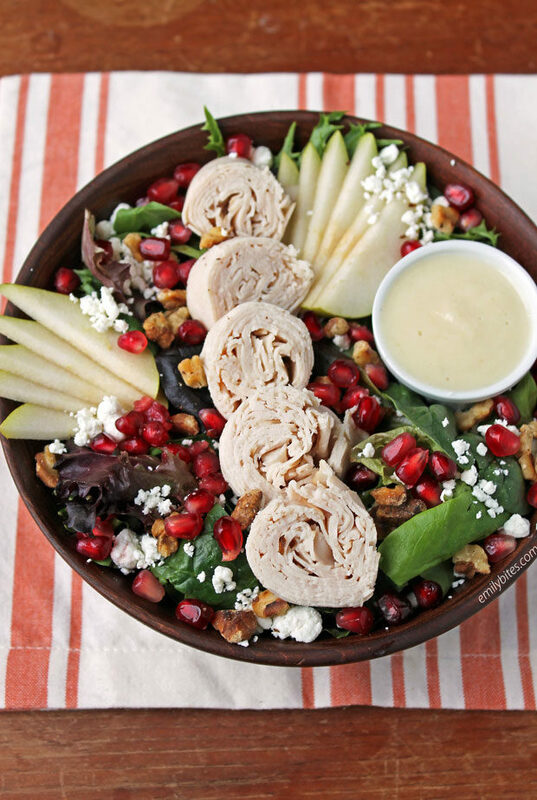 Packed with flavor, this salad has sweet pears, juicy pomegranate seeds, toasted walnuts, creamy goat cheese, hearty turkey and a tangy pear vinaigrette – what more could you want? The dressing comes together simply in just a few minutes, and this filling salad is perfect to pack for lunch, pair with soup (I highly recommend my Butternut Squash Soup to maximize the fall flavor experience, but Creamy Chicken and Wild Rice Soup is also a winner) or eat for a light dinner. Not only is this Turkey and Pear Autumn Salad filling and flavorful, a large serving is only 286 calories or 5 WW Freestyle SmartPoints! Looking for more tasty, lightened up salad recipes? Check out my Butternut Squash Quinoa Salad, Southwest Steak Salad with Avocado Lime Dressing, Greek Chicken Quinoa Salad, Avocado BLT Pasta Salad, Strawberry Steak Salad, Asian Sesame Chicken Salad, Roasted Beet Salad, Pepperoni Pizza Salad, Strawberry Quinoa Salad, Taco Chicken Salad, Broccoli Salad, Antipasto Salad, Harvest Apple Salad, Greek Orzo Pasta Salad, Hummus Chicken Salad, Doritos Taco Salad and more in the Salads section of my recipe index! Peel one of the pears and cut into pieces, removing the core. To make the dressing, place the peeled pear pieces in a blender and add the olive oil, vinegar, lemon juice, honey, salt and ground ginger. Blend for a few minutes until well combined and smooth. Optional step: to toast the walnuts, spread them in a single layer across a dry skillet and bring over low heat. Cook them for a few minutes, stirring occasionally, until toasted. Slice the remaining pear into slices (no need to peel). To build each salad, start with a base of 3 cups of lettuce. Add 1 tablespoon walnuts, 2 tablespoons pomegranate arils, 2 tablespoons crumbled goat cheese, ¼ of the pear slices and about 2 ½ tablespoons of dressing. Looks so pretty and delicious! Will be making this very soon! Looks delicious and beautiful! Definitely making this very soon! How long do you think this dressing will last in the refrigerator?